Walking into the newest Pitfire Pizza on Fairfax Avenue, just one block north of Melrose, I sat down with a group of friends to try their new seasonal menu. Known for producing rustic, fire-singed pizza pies, they arrived at our table crispy, golden and topped with luscious ingredients. The dough is made with just three ingredients: flour, water and yeast. first restaurant opened in North Hollywood in 1997. Lawrence “Larry” Rudolph is the General Manager of the five Pitfire Artisan Pizza restaurants. “Our pizzas are part Neapolitan and New York-style,” he said. A Neapolitan pizza can be cooked in less than one minute, while a New York-style cooks in 20 minutes. Pitfire’s pizzas are finished between 5 to 7 minutes. The dough isn’t really wet, so it takes less time to cook into a golden crispy pie. We tried four of the seasonal pizza pies. I enjoyed the sweetness of the roasted pumpkin pizza with Fontina cheese, toasted pepitas, and a sage roasted winter squash. It was sensational. Next, a slice of the Brussels sprout and bacon pizza arrived. The aroma of the baked brussel leaves, cream, bacon, garlic cloves and fresh parmesan cheese made this pizza so savory with a crispy crust. Both are under $11. Pizza goes nicely with wine or beer. I enjoyed a glass of Pushback Winery’s Sauvignon Blanc from Napa. It had notes of honeysuckle, fresh melon and a wisp of banana. They also offer craft beers for $6 or $18 a pitcher. 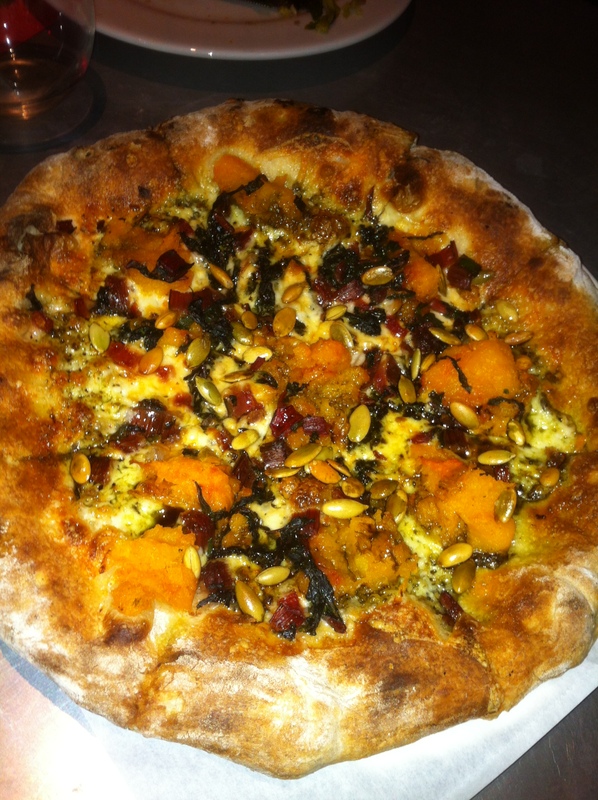 Try a South Bay Strand Brewing Pale Ale with the pumpkin pizza. The Black Market Hefeweizen pairs nicely with the tasty brussel sprout pizza. The last pizza delivered was their “Tuscan” pizza. This is one of the original pizzas made 15 years ago. It’s a super simple, yet tangy pizza made with fresh local mozzarella cheese. It’s topped with roasted potato and sprinkled with rosemary, gorgonzola and a pesto drizzle on top. 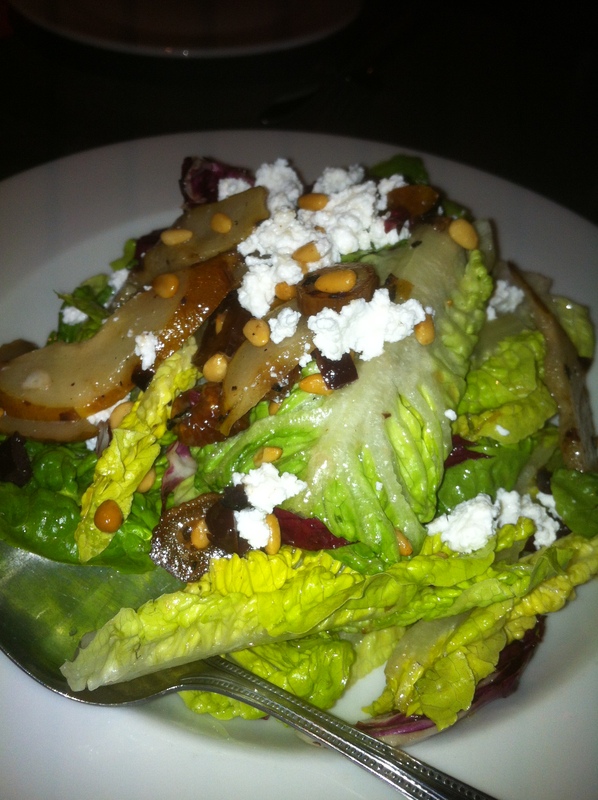 We split the new roasted pear salad with Bosc pears, ricotta cheese, toasted pine nuts, mixed lettuce and a fig and olive vinaigrette. The sliced dates make this salad pop with sweet and slightly salty flavors. Click on this link to finish the rest of my review, courtesy of the Beverly Press. Previous Post Seasons 52 is Changing the Way we Eat – Healthy!